How to process the Payment in Popup Maker? What are Pageviews and how are they calculated? No credit card is required to start using the service, 14 days of Free trial is provided. After the trial period expires, you will still be able to create new popups and your old popups won&apos;t be lost as well. But in order to be able to use/show them on your website, you should subscribe to one of the paid plans of the service. Popup Maker payment is proceeded via PayPal. 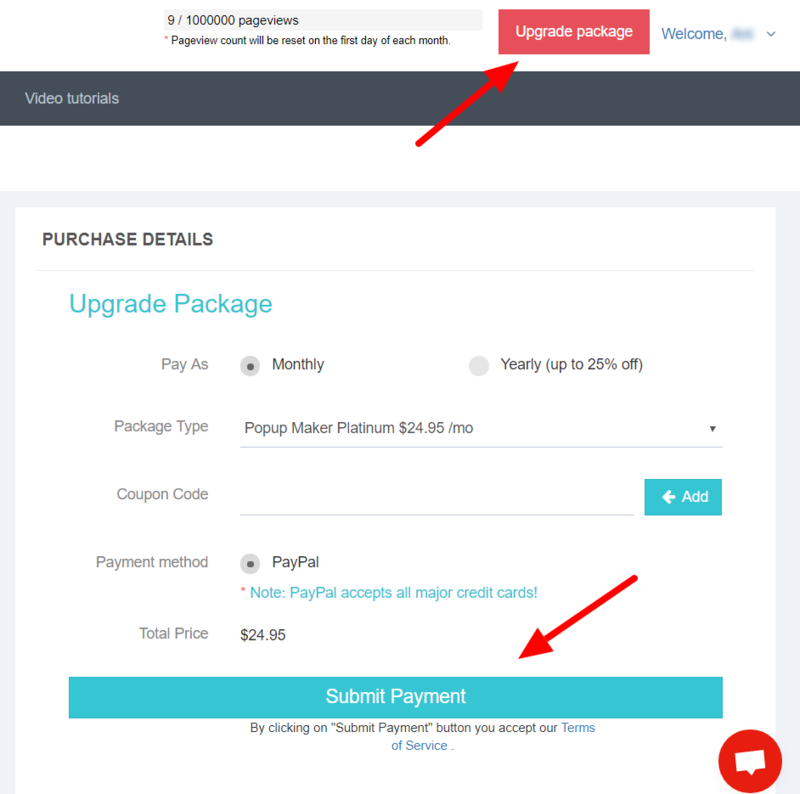 Log in to your Popup Maker account and click on the "Upgrade package" red button on the upper right corner of the page. Purchase details will appear on the screen so you can proceed. Select Monthly or Yearly payment subscription. Yearly subscription is offered with up to 25% off. Now select the subscription plan: Silver, Gold or Platinum. Enter a coupon code for a discount, if you have any. Click "Submit Payment" to finalize the payment.